Continuing their journey, the Turtles, Ninjara and Master Splinter find themselves in the deserts of Iran, where they sneak aboard an oil freighter heading for Oman. Our heroes then cross the sands of Saudi Arabia, heading for Al Hadidah (the Valley of Fallen Stars), which is nearby Mecca, where the legendary Black Stone is kept. Ninjara reveals that the Stone is highly prized by thieves, and it is said to be fifth most difficult item in the world to steal. When the group arrives in Al Hadidah, a large crater in the Earth’s surface, they decide to camp for the evening. While they rest, Master Splinter tells them the history of the area and that of the Black Stone and its importance to the religion of Islam. Splinter also states that since they are so close, they must at least take a look at Mecca. The next day the mutants ride out on camels, and Ninjara tells the tale of a second stone. According to legend, two stones fell – the Black Stone, as well as a White Stone. Reportedly a nomad disappeared with the White Stone before anyone else arrived on the scene. Supposedly wealthy men have been selling the stone for the past 3,000 years and have been trying to steal its Black twin – as legend has it that the man who holds both Stones will live forever. Later, the TMNT find an abandoned city, long ago forgotten when the trade routes changed. The team takes shelter, as a huge sandstorm looms on the horizon. Unbeknownst to them, a falcon has taken news of their arrival to an unsual eagle-headed mutant, who resides nearby. Back at the abandoned city, the Turtles are attacked by a group of men. As they fight, the eagle-headed mutant flies into the fray and smashes into Michaelangelo. We discover that this new threat goes by the name Al ‘Falqa, and he’s under the impression that our heroes have stolen the Black Stone of Mecca. 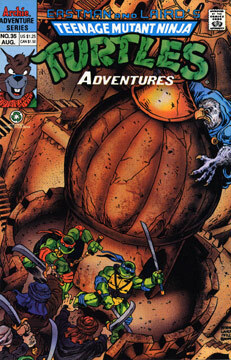 The Turtles and Splinter manage to convince their flying foe that they have not taken the artifact. Al ‘Falqa explains that he was sure they had taken the Stone, as it was reported that six riders had escaped with it. Suddenly, the sandstorm is upon them. Everyone tries to take cover, but Master Splinter is overcome by the force and passes out due to lack of oxygen. From a distance, the Shredder watches the scene via his binoculars and laughs. Contains an additional 6 page story entitled “Mah Name” starring Cryin’ Houn’ by Dean Clarrain and Chris Allan.